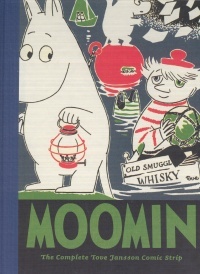 CM Magazine: Moomin: The Complete Tove Jansson Comic Strip. 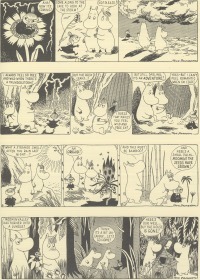 Moomin: The Complete Tove Jansson Comic Strip. Montreal, PQ: Drawn & Quarterly (Distributed by Raincoast Books), 2008. This looking for Martians is getting on my nerves. If it goes on like this I'll change jobs and become a cartoonist or something silly like that. Unafraid to poke fun even at herself, it is no wonder that these cartoon strips by Tove Jansson, originally published in the London Evening News from 1953 to 1959, remain so popular. In this third and final volume of Moomin: The Complete Tove Jansson Comic Strip, the loveable slightly hippo-shaped Moominfamily look at the world through rose-tinted glasses. Their adventures, told in the five full length black and white cartoon strip stories in this collection, allow us to observe ourselves and the world around us from a different perspective. In Moomin in Love, Moomin needs some counselling to reignite his relationship with Snorkmaiden after he neglects her for the novelty of a romance with the beautiful leading lady, La Goona. I can't stop thinking about you spreading a blanket over La Goona. That I am cold of course doesn't matter. Darling, you can have my whole quilt. Take it away! It's stifling here! Moomin eventually makes things right with the help of their friend Mymble who suggests the need for a 'big scene of reconciliation.' Sound familiar? While children will love the twists and turns of the plot lines and the humour in the drawings, it is the adults who share these books with the children who will appreciate the wisdom that Jansson is sharing. Pay attention to those closest to you. Don't be afraid of others even though they may be different. Be careful what you wish for. Appreciate what you have and don't worry about the rest. Not all of Jansson's humour is benign. Some dialogue shows the darker side of relationships. In Moomin and the Sea, Snorkmaiden plays the damsel in distress to help Moomin overcome his fears. Moomin rises to the occasion, but Snorkmaiden reveals that there was more at stake than her safety. So he came anyway. I would never have forgiven him if I had to pity him still more. Nothing, including our faith in scientific proof, is safe from Jansson's satire. In Moomin Valley Turns Jungle, the scientists rescue the Moominfamily from the cages at the zoo where they are being held despite their protests that they are not hippopotami. On the strength of my scientific degrees I hereby declare Moominfamily are not remotely related to hippopotami! At least we have it in black and white for future reference! Jansson has been described as one of the international cartooning greats of the last century. Both children and the adults who share these stories with them will enjoy getting to know the Moomins, a loveable family who have everyday adventures, with a twist or two. The final words are from Stinky, the thief. Oh, well, Gimme that silly tie! Indeed you are the most idiotic family I ever saw – but you are at least living every minute of the day!! Suzanne Pierson is a retired teacher-librarian, currently instructing librarianship courses at Queen's University in Kingston, ON.